The sun has started playing peekaboo as the winter bids its final goodbyes. The grey and gloomy clouds are giving way to bright cherry sun only to return with cold breezy winds by evenings. That's also how my life has been in the last year. Like a sweet and sour pickle. But it all changed at the knock of new year. On 6th January our beautiful daughter 'Tasnim' arrived in this world. Our sunshine is here. She has brightened up our lives with much joy and cheer. Many of you wrote asking about my sudden disappearance from blogsphere. And while I have been protective about my little secret, I want to thank you for keeping me in your mind. Thank you for your generosity of waiting for me to blog again. And while I haven't been blogging, I have been eating and cooking a storm. Probably more of the former than later but I'm hoping a little chopping while my mom cooks is counted as cooking. Every time I cook with my mom I unlearn. Yes, there is just so much food, techniques and more food that internet puts in your face, sometimes we forget about simple pleasures. Whether it is a simple homemade dal with tempering of ghee or simply cooked mutton stew or this basic of Indian pickle. No fancy spices, oil or ingredients here. Just a good old spicy and sour lemon pickle. All across India, pickle is often a necessary condiment with daily food. Whether it's for perking up usual fare or to aid digestion, homemade pickles are often found lurking in fridge, counter top or sunbathing in veranda. Since the sun is around a lot more right now, it's perfect timing to make some pickle with last of winter produce. Whether you bite into the citrus lemon, the crunchy carrot or the lusciously soft and sweet date, each is a treasure in spicy vinegary syrup. 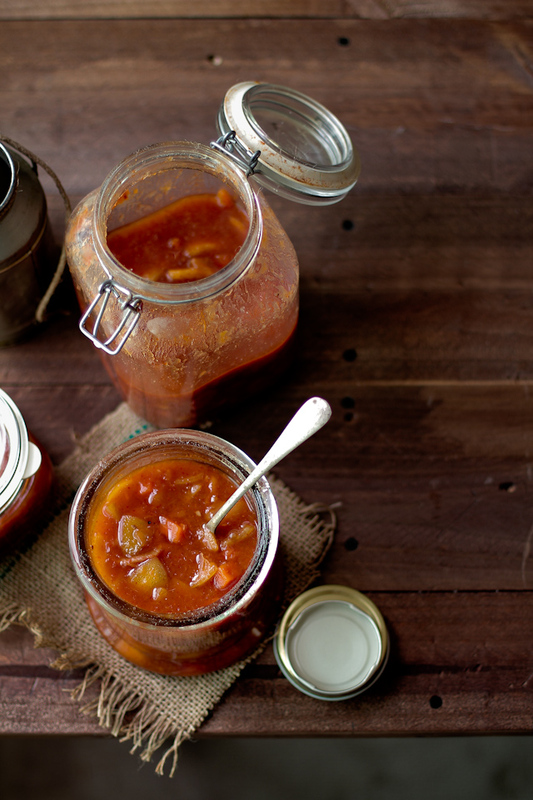 This particular pickle is not limited to winter and is made all year round in our house. But during winters, winter vegetables like carrot or turnips make a great addition. 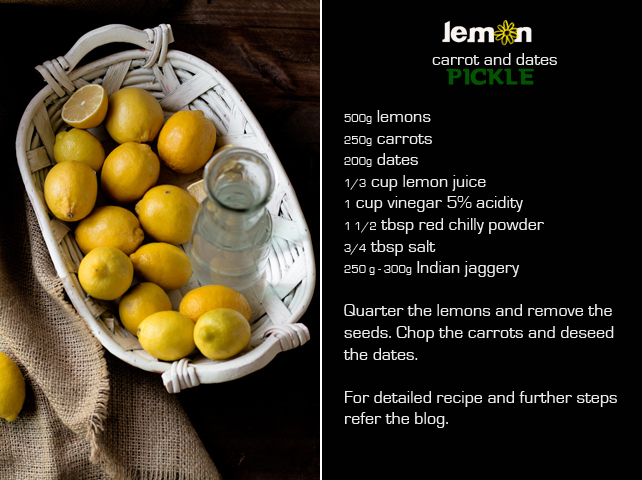 This pickle can be made omitting the carrots and dates too, in which case the vinegar and jaggery ratios needs to adjusted. I usually add half of below and then adjust the sweetness as it matures in the sun by test tasting. 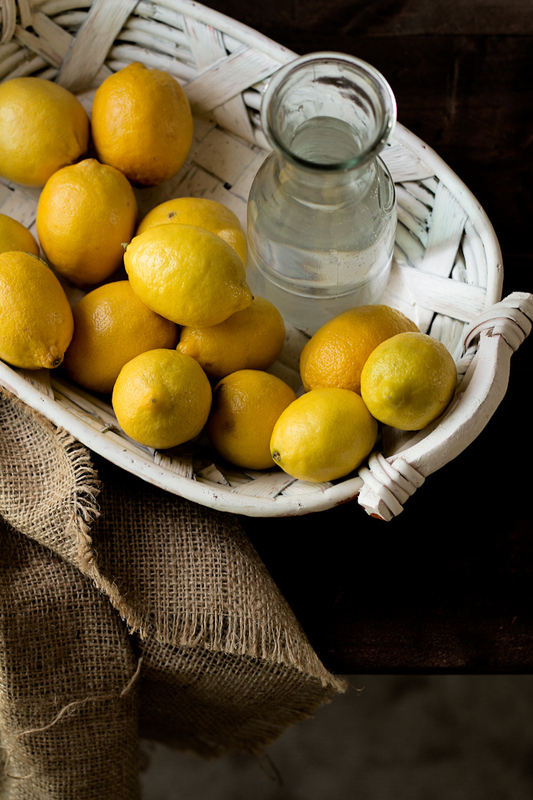 *Typically Indian lime/lemons are used but I have used regular lemons with thin skin. 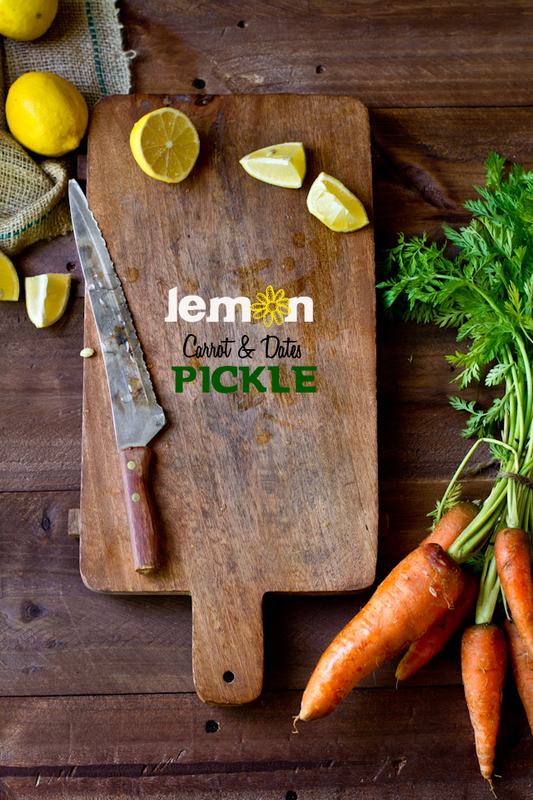 Make sure the lemons are not waxed and best if they are organic since entire lemon goes into the pickle. ** For more spice you can go upto 2 tbsp of red chilly powder. Or more. *** The sourness of lemons vary from produce to produce and I have also found that the sweetness of jaggery is often inconsistent too. Start with the minimum amount and then adjust the sweetness as it matures in the sun by test tasting. Quarter the lemons and remove the seed. Chop the carrots into half inch circles. Deseed the dates and divide into half. In a non reactive pot, add the lemons, vinegar, salt, half the dates, lemon juice, red chilly powder. Cover and cook for 15 minutes or till the lemons have slightly softened. Add the remaining dates and carrots and cook for 15 minutes. Let it cool completely. Transfer to sterilized jars and add in broken jaggery. Leave it in the sun for 1-2 weeks until the lemon is completely soft. While it matures, mix the pickle once everyday with a dry spoon. After it has matured, taste for spice, sweetness and salt. Adjust if required and leave it in the sun for 2 more days. Store in airtight container at room temperature. The pickle lasts as long as 6 months. A wonderful pickle! So original and surely wonderful tasting. Welcome Tasnim! I am sure she's the little sunshine for you Kulsum!! So glad you're back. I really enjoy your writing , photography and recipes. And congradualtion on your little sunshine. Congratulations, Kulsum! Your life is very full right now, and I'm so glad you've made time to blog, I've missed you. This pickle sounds wonderful, I love the whole lemon in it. Can you explain what 'jaggery' is? Sue, you probably figured it out by now but just in case it's still helpful ... jaggery is brown sugar. LOTS and lots and lots of kisses to my Tasnim! Hope to see her soon :-) And yes I can see that you are back with a bang! Wishing you and baby both loads n loads of happiness. LOVE IT ! And guess what my cousin sister's birthday is also on 6th Jan :) I don't think I will ever forget lil Tasnim's birthday. ah Sneh that sound very much like me :) Though ?I'm a November baby! 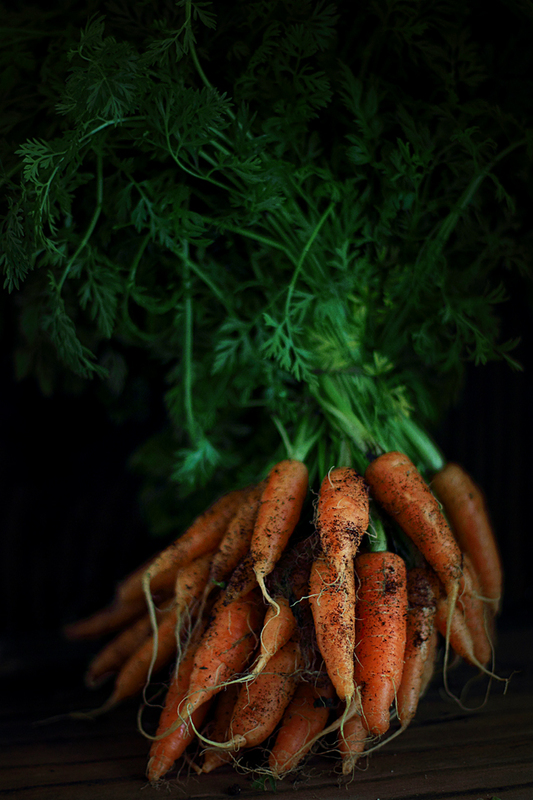 Your photos are so gorgeous, especially of the carrots -they really convey that they were freshly pulled from the earth. Welcome back and congrats on lil baby Tasnim :) Can't wait to catch a glimpse of your sunshine! Welcome back and I know I've already said this - Congratulations! Aaah four day before Hassan's birthday- congratulations! Lovely first post friend! The pickle sounds very delicious. I make a date chutney with all the left over dates from Ramadan but never thought of adding carrot to it. Thanks for the idea. Loved your clicks. That Pickle looks very tempting. Congrats on your little darling brightening up your lives. Take care of your health and enjoy your time with your baby as she grows up. Blogging can wait, but time wont. So enjoy your motherhood for now! Congrats again Kulsum! My youngest is a Jan born too -- Jan 5 :) Achar looks fantastic! Very very long time! :) Congratulations!! :)) Lovely to see a post from you again!! Hugs and kisses to your little Ms. sunshine..
And Happy parenting days ahead. Pictures are beautiful. Did u paint the basket? Welcome back Kulsum - hoe you and the li'l one are doing fine. Your pickle looks lovely. When we went to Kolkata in summers, I clicked all the pickles that my Mum-in-law had made - sad that only 2 of them have manged to make them as posts and the rest are still in the blog queue - this post might just urge me on to finish all my posts! congrats on being a mom :) what a beautiful name.. this pickle reminds me of lemon pickles my mom always made, your version has much more :) :) yum! Congratulations on the arrival of Tasnim - 'your spring in paradise' such a pretty name and motherhood is the best thing you will ever experience! I've missed your beautiful blog posts so much, it makes me happy to see you back in action. We still need to catch up!! I think I subscribed to your blog just before you took time off. I wondered what happened to you. Congratulations on your little bundle! Life and love will take on a completely different meaning now. Girls are precious! Your photographs are stunning as usual. Those carrots are my fav! Congratulations Kulsum! What divine news. Happy to hear you are happy and doing well. As for this pickle, the flavors are absolutely fantastic. I love dates and carrots together, so I imagine the sourness of the lemon would cut through it all beautifully. Congratulations! And thanks for sharing this wonderful recipe. I have not had this type of pickle before and would love to make it. hello Kulsum..not sure if u wud remember me..but aages back i had received a comment on my previous blog (a kitchen scientist and a white rat hubby) saying u were so peased to find a co-blogger from kuwait. well...its the same me, but now blogging in a whole new space. subscribing to ur posts so that we stay connected. hope u doing great and the clicks are just great as usual! Wow.. what wonderful post and pictures. I am totally hooked to your page !! Followed and Liked on FB..
Congratulations on the baby, it is good to have you back! The sweetness of the dates sounds like a great combination in the pickle. Awwwwww congratulations on the little one! That is such wonderful and exciting news :) And this pickle sounds amazing, I have been getting more and more into pickling things lately and I love the thought of using dates in one. Beautiful photos, too! Congrats on your new bundle of joy. This is my first visit on your blog & I'm loving the photos as well as your completely original and delicious take on pickles. Would love to try this combination of flavors out! I absolutely love your blog. Congratulations on the new addition to your family. This is a delicious recipe. Love it.